Genre films face a chronic problem: they have to introduce viewers to new worlds quickly and efficiently. There’s often so much lingo and history to lay out that writers have to choose between clumsy information dumps, or leaving their setting unexplained for long stretches, so they can get to the action. By the time a film’s original science fiction or fantasy setting starts feeling familiar, it’s about time for the credits to roll. That’s one of the many reasons studios find it so irresistible to turn these titles into franchises. By the second outing, the groundwork has already been laid, and the writers can hit the ground running. The challenge is producing a first film that’s worthy of a sequel. Alita: Battle Angel, based on Yukito Kishiro’s 1990s manga series Battle Angel Alita, is a triumph of worldbuilding and a failure of storytelling. The film is set in a distant future following a devastating war that leveled all but one of Earth’s great floating cities. That last survivor, Zalem, is fueled by the factories of Iron City, and the humans and cyborgs who live in Zalem’s shadow literally feed off its scraps while dreaming of a better life above. Scrounging for spare parts amid the trash Zalem dumps down to Earth, the kindly cybernetics genius Dr. Dyson Ido (Christoph Waltz) discovers a cyborg girl who’s still alive, and repairs and adopts her. 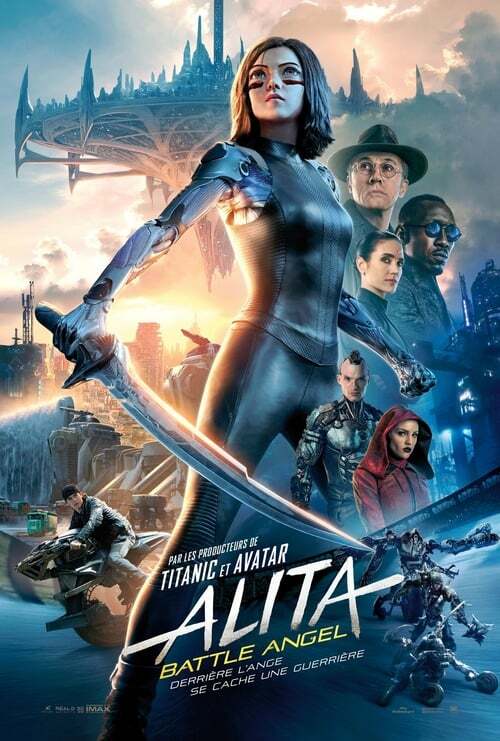 The amnesiac Alita (Rosa Salazar) progresses from wonderstruck child to moody teenager over the course of days, rebelling from Ido’s fatherly protectiveness to spend time with her generic “criminal with a heart of gold” boyfriend Hugo (Keean Johnson). Alita has a particularly good reason for thrill-seeking, as a battle against the cyborg equivalent of Jack the Ripper triggers some memories of her past life, and convinces her that more violent conflict might reveal more information. Like a video game hero, Alita progresses through the film, earning gear upgrades and memories of extremely lethal martial arts that allow her to take on increasingly more powerful threats. The cliché game plot isn’t helped by the film’s cartoonishly evil villains. Jennifer Connelly plays Chiren, Ido’s haughty, morally compromised ex and fellow cybersurgeon. She stands out from the grittier denizens of Iron City, with her fine clothes and a forehead gem which looks distractingly like a BIM mark from the trash classic The Apple. Grewishka (Jackie Earle Haley), the hulking murderous cyborg hunting Alita for much of the film, at one point literally kills a dog just to show how irredeemably evil he is. Moonlight’s Mahershala Ali fares a bit better, by virtue of a plot quirk that has him alternately playing sports mogul Vector, and Zalem’s maniacal ruler Nova. But his acting talents are largely wasted on the clunky script, written by James Cameron and Laeta Kalogridis. Too much of the film is devoted to Alita and Hugo’s YA romance and to “motorball,” a sport that provides the same action setpieces and irrelevant narrative filler as Harry Potter’s Quidditch or The Legend of Korra’s pro-bending. The only clear way to make it from Iron City to Zalem is to become motorball’s champion, making it an obsession of scrappy teens like Hugo, who play it with little more than motorized rollerblades, skateboard ramps, and a ball. But practiced professionally, it’s more like the eponymous event in Death Race, a sport for athletes who have traded most of their bodies for cybernetics, and are ready to creatively eviscerate each other for control of the ball. The fact that they can survive nearly anything, since they’re only losing metal bits, lets Alita deliver some pretty brutal fights while maintaining its PG-13 rating. The movie’s action is phenomenal, especially in 3D, where the motorball matches and fight scenes send balls and all manner of vicious weapons at viewers. Director Robert Rodriguez (El Mariachi, Spy Kids, Sin City) does excellent work with the CGI-dominated battles, bringing the film’s anime and cyberpunk aesthetics to life, and taking advantage of the impossible feats cyborgs can perform. Characters like the scythe-wielding organ harvester Nyssiana (Eiza González) are barely human: when cornered, Nyssiana leaps upward, flips the angle of her limbs, and pins herself to the side of an alley, hissing at Alita like a cat. In one particularly thrilling and surprising battle, Alita leaps at Grewishka through a cyclone of chains. There’s also a spectacular brawl at a bounty-hunter bar that lets a wide variety of minor characters show off their skills, including the cowboy-esque McTeague (Jeff Fahey) and his pack of cyborg dogs. The hints about Alita’s identity, the intrigue in Zalem, and the events that led to the fall of the other cities are tantalizing and frustratingly scarce compared to Alita’s time with Hugo. It’s hard to care about his generic advice about staying true to your dreams, or about Alita’s introduction to chocolate, when it’s coming at the cost of fights on the moon and elite Martian soldiers training in space. The reason those details are so scarce becomes clear at the film’s unsatisfying conclusion, which is meant as setup for a sequel. The ending is strangely similar to that of 2006’s Eragon, attempting to build excitement by revealing the big-name actor playing the main villain. But Eragon was a financial disappointment in the US, the sequel was never made, and John Malkovich never got to really play King Galbatorix. Alita: Battle Angel is a much stronger movie, so it’s more likely to find its franchise footing. But it’s a shame that the film doesn’t stand on its own, with a story as creative and engaging as its setting. Our website address is: http://imastlouis.org.